When I first found out that JET placed me in Awaji-shi, I immediately began to research the island on the internet. Surprisingly, one of the first sites I came across was a travel blog claiming to have found the best burger joint in Japan. Despite being called Awaji-shima Burger, or 淡路島 バーガー, it was not even on my island. Instead, it was located about an hour from me, in a town called Nishinomiya, in between Kobe and Osaka. That it didn’t matter. I still made the trek to check it out. When you’re an American living in Japan and you are craving burgers, nothing will stop you. It took me less than a month since arriving in Japan to taste these burgers for myself. After meeting up with a friend in Kobe, and spending $14 on a jar of Skippy’s peanut butter at a world food store (no regrets), we ventured a few JR train stops east of Sannomiya to get off at Nishinomiya. Using good old Google maps on an iPhone, we were able to find the general vicinity where the restaurant should be. From there we followed the mouthwatering aroma of fried onion rings and greasy burgers. 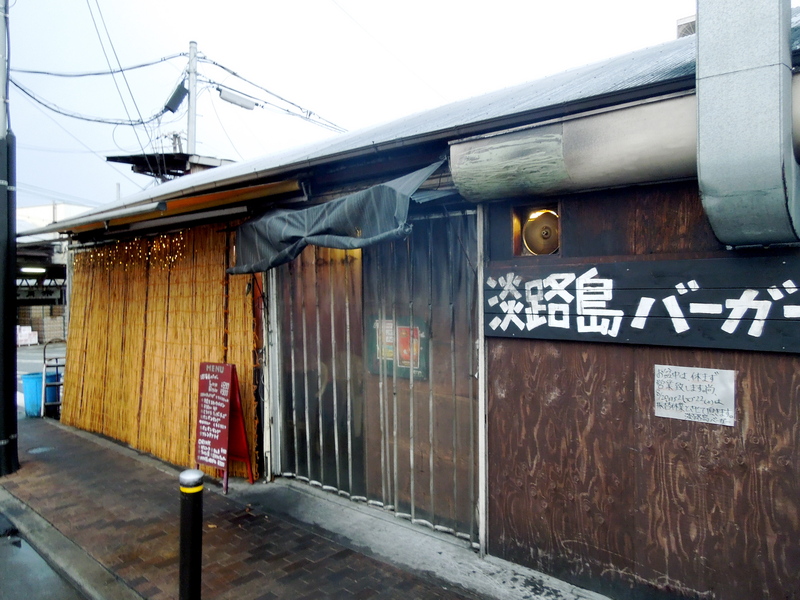 Before I knew it, I was standing in front of a tiny hole-in-the-wall shack, with signs taped on the plywood walls, and weathered bamboo external blinds shading the windows. It didn’t look like much, but you should never judge a book by its cover. If you follow the smell of fried onion rings and burgers, you will end up here. After entering through clear PVC strip curtain hanging from the doorway, I was seated in the approximately 75 sq. foot dinning area. In here, there is only one way to dine; and it’s sitting in a low stool with the table top almost as high as your chest when sitting. The menu was all in katakana, but reading words like hamburger, ハンバーガー (Ha’n’ba-‘ga-) was no problem. Foreign words are spelled in katakana, and are pronounced just like they sound in English. 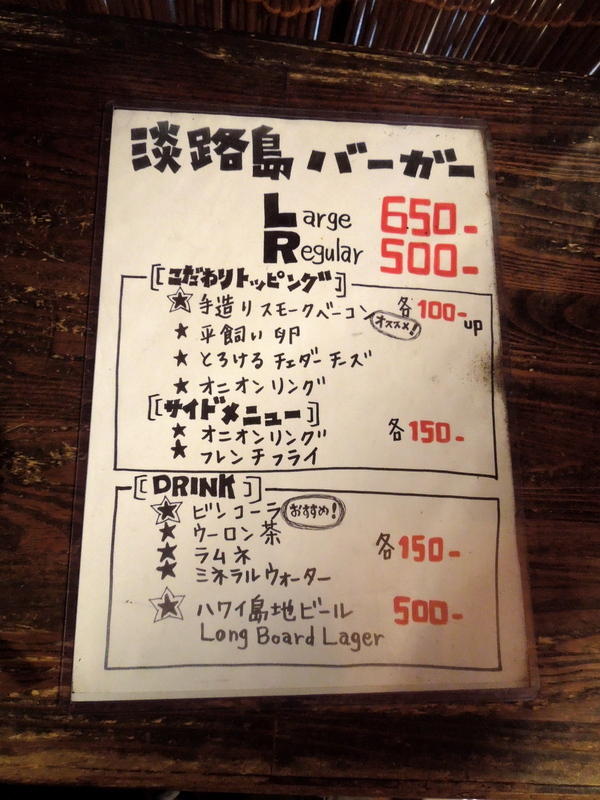 There are two options on the menu: regular size for ￥500, or large for ￥650. And for an extra ￥100 you can add cheese, onion rings from Awaji (where I live! ), home-made bacon, or a free range fried egg. However, you may not need too many extras, since the burger comes pre-loaded with organic lettuce, tomatoes, sauteed onions, and their own secret sauce (yes, it beats In-N-Out’s sauce). Look on the top right of the menu: バ is pronounced, “ba” and, ガ is pronounced, “ga”. So together it reads, “ba-ga-“, which means, “burger.” Get it? But, the best part about the burger is the beef itself. After all, that’s what the focus should be on when you’re talking burgers! I did not clarify this with the owner, but I heard the beef is from Awaji Island. If that’s true, then the burger I ate came from cows that are regularly messaged and fed beer. That sounds crazy, but trust me its true. In fact, some of my students are from families that own these farms. Needless to say, the burger melted in my mouth. Who wouldn’t want a burger from this guy? I ordered a large with cheese and bacon, and it was everything I thought it would be, and more. More than satisfying, this burger may have ousted my favorite burger spot back home from the burger throne. I would need to eat them together to declare a winner. But as the grease dripped from my chin, while melted cheese slid out the back, I was convinced I found the best burger in Japan. The next time I’m in Kobe, I will make the extra twenty minute ride to Nishinomiya to feast on some Awaji-shima burgers and onion rings. The picture doesn’t do it much justice, but this burger was delicious. This entry was posted in Food, Traveling in Japan and tagged Awaji, Awaji-shima Burger, Hamburger, Kobe, Kobe Beef, Nishinomiya, Onion Rings. Bookmark the permalink. It’s THAT good. I hope you enjoy it! How’s your tiny island? 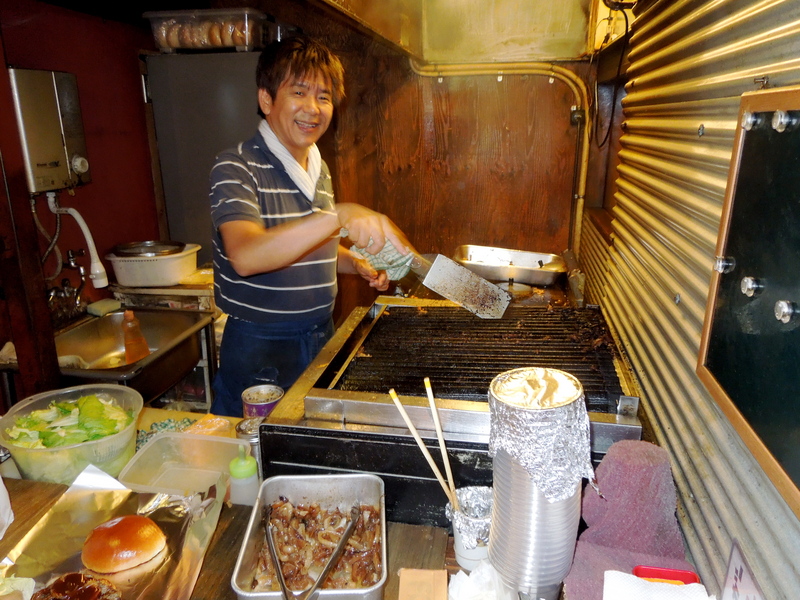 I visited there with a Kobe friend last year…loved the onions. Awaji is treating me nicely. I’m enjoying some really good food, and yes that includes the onions that you see for sale at just about every store. I hope you have been enjoying your time in Japan so far! Loved this story too. I never had a burger in Japan but I go the extra mile and dollar to get Kobe beef at Central Market in Dallas. Thanks for sharing especially with pictures! Much good, But sent from my iPhone so sorry about auto in-correct! Thanks, Peggy. It’s definitely worth the trip. nakkie, thanks for the suggestion! I actually went there already. It was pretty good, but I have to say that Awajishima burger in Nishinomiya was better. 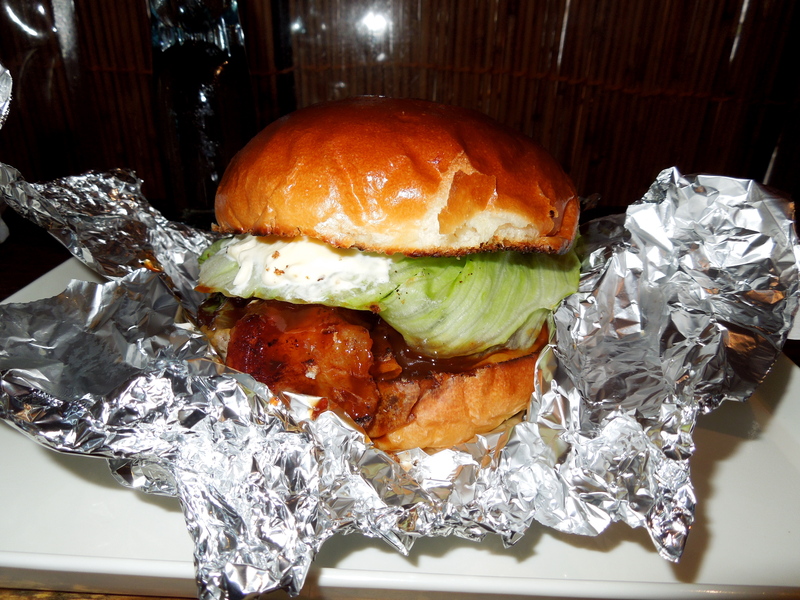 Well, I recommend you Sasebo burger. Ask your Japanese colleagues to explain them in English! No1Genki, thanks for the recommendation. I’ll have to check it out! I am actually moving to Nishinomiya next spring to work! I will definitely have to check this place out as it is also one of the first sites I saw when I put in the city name. I am so excited yum yum yum! You are in for a treat. Good luck on the move! Thanks, Brandon. I hope you had a fun time in Osaka. I haven’t been yet, but I want to visit your neck of the woods in Tokushima. We leave tomorrow for 3 days in Osaka…very excited! If you end up out here in Tokushima, let me know and I’ll help however I can! Happy New Year! I’m heading to Nihon next week and I’m going to visit this place for sure. the guy looks like a champ. I hope he’s open. I just got back from Osaka. We were staying in Awajishima on the last stretch. Having done my research before the trip, I read a blog about Awajishima’s Beef thus the burgers – then a online guide of the best burgers in Japan locating all on Awajishima. Japanese tourism marketing at work… they are very good and at times honest, but I gotta say NOT about their burgers on Awaji island! The First Ranked Burger joint (according to Awajishima Tourism board) was close to the Awaji IC or SA (interchange or Service Area), so I thought what the heck – we were hungry and desperate, why not. Its one of the worst food decision one could make in Japan. The joint is located at a sort of scenic view of the Bridge (which is not too bad), there is a building with foot onsen and a fast food eatery. The #1 burger is not sold there, its actually sold by the Foot Bath people! DODGY! After forging 900 yen for 2, we got a few thin slices of hotpot beef in a cheap mushy bun. Its a laugh. But if you spent an hour looking for it, its murder! SO DO NOT TRUST the Awajishima Burger Official Guide! Awajishima Burger – THE SHOP is the only place that serves real good burger with Awajishima beef patties. AND its definitely my new must-go destination in Kansai from now on! Thanks for sharing the info! Ganbade!